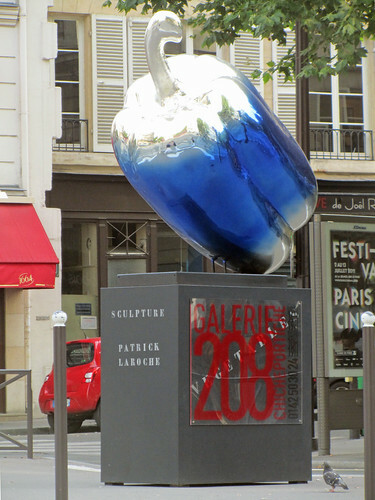 There is a giant blue pepper (by Patrick Laroche) sitting at Place René Char, nestled between Boulevard St Germain, Boulevard Raspail and rue du Bac. Very shiny and as much as I love my veggies, this is just weird as an art concept. Seeing the “pepper holder” referring to Galerie 208 Chicheportiche, there are, presumably, more vegetable sculptures in that gallery. Aaaaand speaking of pepper, I recently tried stuffed chilli pepper at a Peruvian restaurant near Jardin des Plantes. Delicious and authentic food to be had there, and boy has that dish had a good kick of spice in that chilli. Even for someone with high tolerance to spicy food, I was losing my tastebuds to the heat of the dish. Not a dish I could recommend to too many people I guess, which is a shame, because it was pretty tasty. me love peppers too…fresh and crunchy!